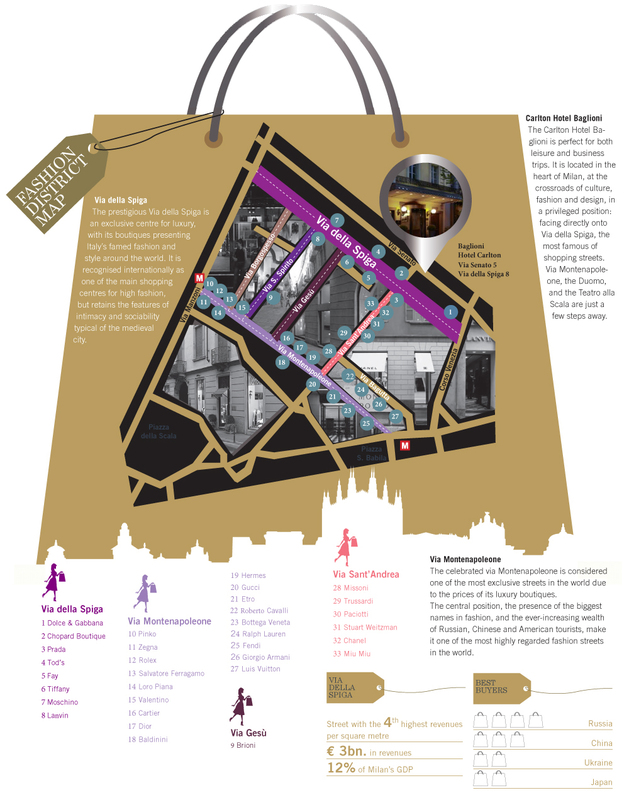 A ready-to-use map of the most fashionable shops in the Fahion Square, the beating heart of Milan. Signed by Baglioni Hotel Carlton. The prestigious Via della Spiga is an exclusive centre for luxury, with its boutiques presenting Italy’s famed fashion and style around the world. It is recognised internationally as one of the main shopping centres for high fashion, but retains the features of intimacy and sociability typical of the medieval city. The celebrated via Montenapoleone is considered one of the most exclusive streets in the world due to the prices of its luxury boutiques. The central position, the presence of the biggest names in fashion, and the ever-increasing wealth of Russian, Chinese and American tourists, make it one of the most highly regarded fashion streets in the world. The Baglioni Hotel Carlton is perfect for both leisure and business trips. It is located in the heart of Milan, at the crossroads of culture, fashion and design, in a privileged position: facing directly onto Via della Spiga, the most famous of shopping streets. Via Montenapoleone, the Duomo, and the Teatro alla Scala are just a few steps away.